Hofbrau Pizza’s are made with our home-made pizza sauce and 5 different cheese blend. Ham, Pepperoni, Italian Sausage, mushrooms and extra cheese. 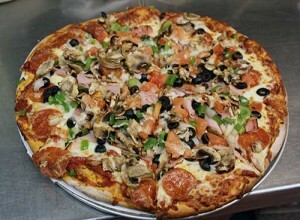 Ham, Pepperoni, mushrooms, onions, tomatoes, green peppers and olives. Ground chuck grilled and crumbled on top of our homemade special sauce ( mayo) and melted cheddar cheese, served deluxe with lettuce, tomato, pickle and onions with ketchup and mustard. Sounds weird but this pizza rock! We use homemade sweet BBQ sauce, fresh grilled Chicken, Red Onion, Bacon and load it with our five cheese blend. Pepperoni, Italian sausage, ground chuck, Black olives, green, olives, blue chees crumbles, green peppers, mushrooms, artichokes, onions, banana peppers, chicken and bacon. Extra cheese is also an extra charge.